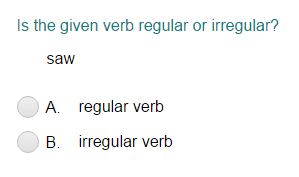 What did you think of Identifying the Verb as Regular or Irregular ? Past tense verbs describe actions that have already happened. Most past-tense verbs are regular and end in -d or -ed. However, some verbs in the past tense are irregular too.